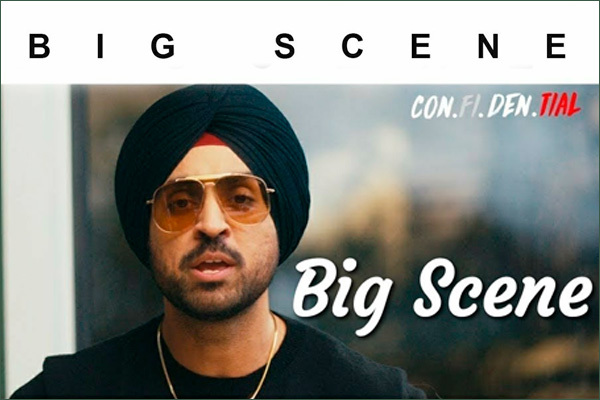 MUMBAI: Big Scene, a track from Diljit Dosanjh’s Punjabi album CON.FI.DEN.TIAL, is all set to sway you towards the party hall with those peppy music beats. But, before that happens you might actually drool over his looks in the song. He is definitely dressed to kill. The singer-actor has left no stone unturned to bring across a new Dosanjh through the album CON.FI.DEN.TIAL. If you are an observer you would notice that this Laembadgini singer has lifted up his fashion game with some rugged jackets. Big Scene has been penned and composed by Rav Hanjra, who’s done the same for all the songs in CON.FI.DEN.TIAL. This one also has a good blend of music by Snappy. The track has been shot beautifully and has put all the elements in place. Big Scene happens to be the eighth track from CON.FI.DEN.TIAL and has been on a significant rise on YouTube. CON.FI.DEN.TIAL, a nine-track album has been produced by T-Series. The lyrical video of Beedio Call, last track from the album is already out. Also, the rest of the songs from the album have been getting a great response with High End receiving 40 million views in a month, Offline, Sorry, Weekend and the rest of the songs have marked up a significant rise in their views. The CON.FI.DEN.TIAL album recently claimed the number one spot on Indian charts and number two on Canadian and New Zealand charts. Given the success of the album, Dosanjh will be heading to UK this May for his CON.FI.DEN.TIAL tour.